Britain is winning the war against tobacco smugglers who target cheap cigarettes at poor smokers and children and deny the Treasury revenue, according to a parliamentary report. In 2000, one in five of cigarettes smoked came from the black market. But by 2010-11 traffickers’ share of the cigarette market had fallen to 9%, according to the report on the illicit tobacco trade by the all parliamentary group on smoking and health. Over the same period, the share of the UK’s hand-rolled tobacco market originating with smugglers fell from 60% to 38%, an inquiry by the group of MPs and peers found. Joint action by HM Revenue & Customs and the UK Border Agency has disrupted smugglers’ efforts to bring in and distribute their products, as have partnerships involving local police forces, councils and NHS organisations, the report says. Stephen Williams, the Liberal Democrat MP who chairs the group, said the success disproved the industry’s claims that high taxes on their products in the UK boosted the supply of illegal tobacco. He said manufacturers’ claims that forcing cigarettes to be sold in standardised packaging would increase the illicit trade were “self-interested and at times seemingly disingenuous industry lobbying”. Legal agreements the EU has concluded with the big cigarette firms to reduce trafficking has also helped make fewer available, the parliamentarians say. Their report highlights how the previously easy availability of black market tobacco in the UK was partly due to producers deliberately exporting more cigarettes than were wanted to other countries, knowing that many would be smuggled back into Britain. The Tobacco Manufacturers Association claimed that more recent data showed that “the level of cigarettes consumed that are not UK tax paid has risen from 17% in 2011 to 21% in 2012″ and that figures from the Office of Budget Responsibility last week showed the government expected to receive £200m less in tobacco revenue in 2012-13. A spokesman for the association claimed the inquiry was biased because it had not given a fair hearing to the industry and did not mention firms’ contributions to reducing smuggling. Only one in 10 companies assisted their employees to quit smoking in the past year, according to a study. Lok Sin Tong Benevolent Society Kowloon and the University of Hong Kong surveyed 300 companies last month. Most companies have no policy about smoking or are not aware of any, the survey found. Over 46 percent of respondents believe smokers have the right and freedom to smoke. One in five companies say there are inadequate resources to implement a no-smoking policy and that it is not their responsibility. 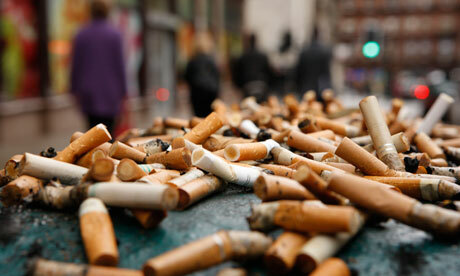 More than 90 percent of respondents agree that staff smoking habits adversely affect the environment and company image. Half supported different ways to encourage people to quit, including posting “No Smoking” notices in the premises. Lam believes the most effective way of assisting smokers to beat the habit is to increase tobacco duty. Ma Lik, a gardening manager, smoked three packs of cigarettes a day for 40 years. “My health got worse about 10 years ago,” he said. Through a service by Lok Sin Tong, he was able to kick the habit. Lok Sin Tong chairman Kwong Cho-shing said many companies lack resources to help employees overcome their nicotine addiction. The organization is promoting a two-year pilot scheme for 50 companies so that they can set up quit-smoking policies, health seminars and cognitive behavior treatment services for their employees.